I think I’ve hit an all time low. Those of you who know me well probably know I’ve dabbled in online dating for some time. Sure, I’ve had some successes with online dating in the past. The last two men I’ve met on a dating website have been two out of three of my longest and most-serious relationships. They’ve taught me a lot about who I am and what I’m looking for in a relationship partner. Except for recently. My dates have been a complete nightmare. For example, the last guy I went out on a date with professed his love for me on the first (and only) date. And when I didn’t respond to his 34 back-to-back text messages comparing our love to Romeo and Juliet, he managed to use his police officer capabilities to find my address so he could come to my house to make sure I wasn’t dead. And last night I realized that I have subconsciously given up on online dating. Because instead of reading my matches’ profiles and perusing their many photos with beer cans and cropped out ex-girlfriends, I’ve been looking at their job titles. And not in the “I wonder if he makes good money” sort-of way. More in the, “oh, he’s a Graphic Designer. I wonder if he could be a fit for the job I’m recruiting on” sort-of way. I have officially started recruiting my matches. I’m convinced I am moving one step closer towards being a cat lady. Or maybe work has taken over my life. Or maybe online dating is the new LinkedIn for recruiting? Or maybe I’m just still trying to find that needle in a haystack. Yeah, we’ll just go with that for now. So until I find that needle I’ll just keep making delicious recipes to share with the World. 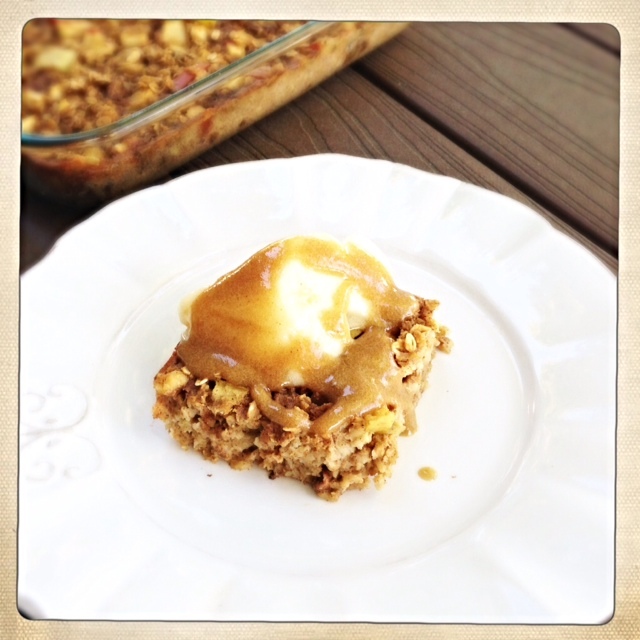 I made for you Apple, Cinnamon and Walnut Baked Oatmeal with a Date Caramel Sauce. 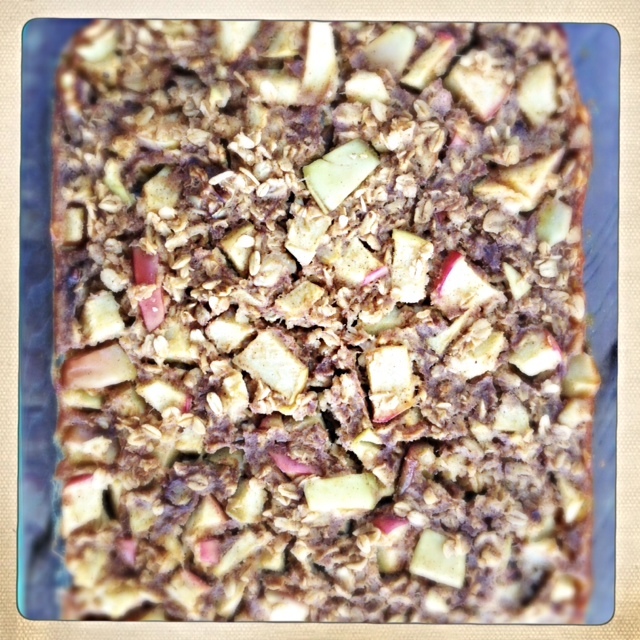 It’s incredibly easy to make and you can make a batch earlier in the week and have a slice for breakfast each morning. Or you can turn it into a healthy apple pie and have it for dessert. Or you can have it for breakfast AND dessert. And the best part? It’s guilt-free. And doesn’t come with stalking. Top the oatmeal with a guilt-free caramel sauce, made from just 4 ingredients and NO sugar. I think I just found my Romeo. Philly girl with a big appetite and an unusual curiosity for all things food and travel. Pancake lover. Whiz wit all the way. On an adventure to live my dreams, will you follow me on my journey? Follow Eatin’ the Dream on Facebook! Happy 65th to this man. I love you!